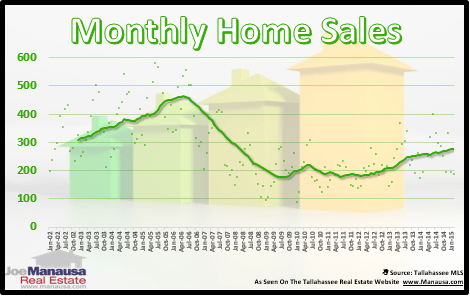 Recently a long time reader asked me if our home sales reports fluctuated at all if we looked at the different types of real estate listings that were selling. 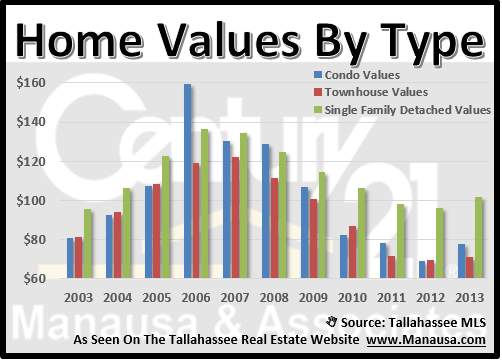 Basically, she wanted to know if condominiums, townhouses, and single family homes all were responding to the changes in the Tallahassee real estate market in a similar manner, so I created some new graphs to find out. Our first real estate graph shows the number of closed home sales by type each year. Our graph shows closed sales for single family homes (green), townhouses (red), and condominiums (blue). We see that single family home sales have been on the rise for the past two years, while townhouses look to post more this year than last year. Condominium sales look to be about the same as last or maybe still lower. Remember, all prior years are the full year, while 2013 only shows closed house sales through mid November. When we look at a similar graph showing the change in value of closed real estate listings, the results change. Unlike unit sales which showed two years of growth for single family homes, average values only started to rise this year. Townhouse values have also risen (slightly) this year, but condominium values have risen significantly. I think this is mostly "noise" in the data, where very low sales are impacted by short sales (low price per square foot) and downtown unit sales (higher price per square foot). To truly be accurate, each neighborhood or condominium complex with homes for sale would need to be studied in full. 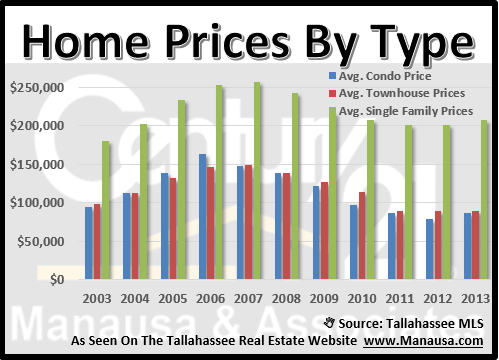 Right now, the average price of each type of home sold in Tallahassee has remained fairly flat over the past three years. This is due largely to historic low interest rates which allows people to buy "more home" for their money. I suspect when we see mortgage interest rates rise substantially (which they must do eventually), we will see a decline in buying power and the average home sales price will adjust downwards. I hope you can see that reports of market generalizations might be convenient, but they do not serve to guide you when you negotiate a real estate transaction. If you would like to know the real value of a property that you own, just drop me a note and we can schedule a time to evaluate your home. Whether you plan on competing with current real estate listings or you plan to wait for the future, knowing your home's value is a great first step for property owners.